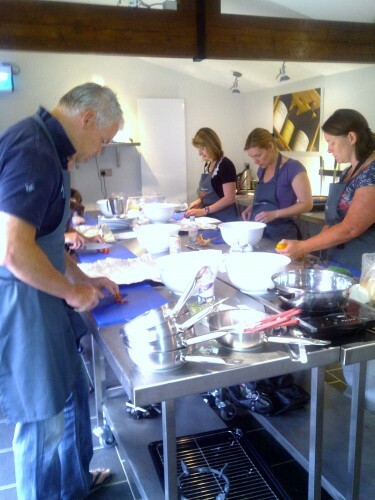 Our corporate cookery classes are as much about the food as they are developing professional relationships, encouraging teams to work together under pressure and inspiring shared success. Our corporate cookery events offer both a relaxed environment for meetings alongside a great way for you to engage your colleagues and strengthen working relationships. At Shires Cookery the emphasis is on fun, relaxation and enjoyment. We offer an array of custom-built sessions to provide cookery experiences for small to medium sized groups of business professionals. All hosted by one of our professional chefs. Call us to discuss your business needs or alternatively why not try out one of our ready to go courses adapted to suit you. Looking for a cooking event with a more competitive edge? We can tailor our hands-on sessions so that teams or individuals are pitted against each other. We also offer a mix of recognised style challenges such as timed sessions like Ready Steady Cook through to MasterChef inspired courses. Change your meetings to a more informal setting and let the creative juices flow. More and more companies are using our courses to stimulate fresh thinking. Whether you’re motivated by the team work during the cooking activities or by the smell of fresh cooked food, it’s sure to generate the right atmosphere to inspire. What better way to get to know your client than joining them at our fantastic location, opening up a more genuine relationship based on shared experiences? On a practical level, it is much easier for you or your team to mingle with clients while milling around our kitchen than being restricted to sitting next to one person over three courses. As part of your day you may also wish to take advantage of The Red Lions meeting rooms, beautiful gardens, enjoy a drink in the bar, or retire to one of the recently refurbished bedrooms. Our packages start at £65 per head. If you would like to come and view our facilities we would be more than happy to arrange a meeting and give you a tour. To find out more information please call us on (01604) 621640 to discuss dates and menus.